Just lovely! The leaves around here are still hanging on — so November is lovelier than before. And the sky has been magnificent — grays, whites, blues, pinks all mixed together! The light is good too! When you look for it, there is always beauty. The light on the trees in your last photograph — how marvelous! Love both your photos and the comments on this one! November happens to be the month of my birthday so there is always a ray of sunshine in there for me 🙂 And even as I hate to grow older, I know it beats the alternative so I still celebrate! I like your sandwich comment about summer and the holidays – a great perspective! Glad you liked, Tina. November is my birthday month, too! Was going to make the same point as you but it’s already long enough and would send me on another tangent. 🙂 Happy birthday to you! Lots of great color, and I love surprises like your rainbow. Thank you. It’s one week later and the colors are more muted. Still lots of beauty, though. 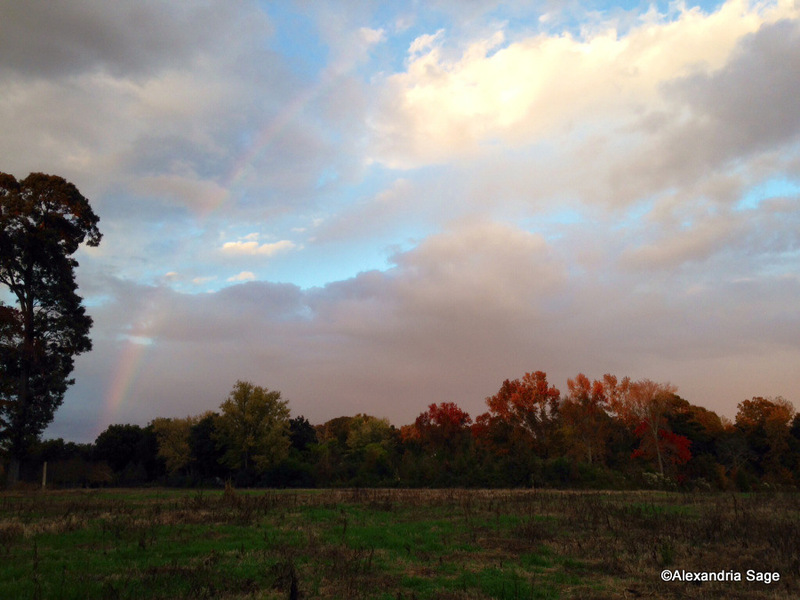 A rainbow in autumn was such a delight. Yes, an unexpected surprise. It was magnificent to be sure. Indeed a surprise. Glad to bring you a smile! Thank you, Amy. It was truly magnificent, a surprise indeed. So glad you liked it! That is a beautiful sign of better things to come. Something I wish a lot of my countrymen can feel in the hearts. Thanks you. A blessed day to you.